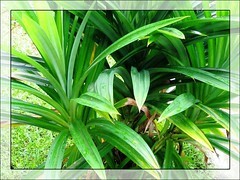 is one of those long-domesticated plants and is the only Pandanus species with fragrant leaves. Our backyard garden is never without this essential plant! They’re popularly used for adding fragrance in desserts, cakes, rice (especially ‘nasi lemak‘, one of our favourite meal), etc. For added flavour too, they can be used as wrappers for meat and seafood for frying, baking, grilling or steaming. Origin: Probably originated from Moluccas, Indonesia. Widely cultivated in tropical Asia, namely, Sri Landa, Thailand, Vietnam, Indonesia, Malaysia, Philippines. Ref: USDA, ARS-GRIN and Gernot Katzer’s Spice Page. Features: Pandanus amaryllifolius, the only species with fragrant leaves of the genus, Pandanus, grows between 0.5 to 1 m tall but can reach up to 2 m in height. As the perennial plant ages and lower leaves are trimmed for culinary purposes, it becomes top-heavy and produces aerial roots and stilt roots to support itself from falling. Foliage is evergreen with slender leaves that are lush-green and smooth-edged measuring roughly 30-50cm long. Their leaves have a depressed center running from the axis outwards and gradually flatten towards their tips. It produces suckers laterally and abundantly, especially if grown on the ground with good conditions and these can be used to propagate new plants. Sometimes, it does develop aerial plantlets too. Culture (Care): P. amaryllifolius is an easy to grow herb that requires very little care, especially in the tropics. Light: Prefers semi-shade to full sun, though protection from the strong afternoon sun is advisable to avoid foliage being scorched. Moisture: Require regular watering and humid environment for best growth. Soil: Grows well in any kind of well-drained soil in container or ground. Others: Remove dried or wilted leaves. If necessary, prune the top section if the plant becomes lanky and top-heavy…. the tip cutting, together with its couple of aerial roots can be replanted to rejuvenate its growth while the remaining leafless stem with roots anchored in the soil can be left growing with some care which will eventually develop aerial offshoots for multiplying your stock. Feed fortnightly with a balanced soluble fertilizer. Fragrant Screwpine is least bothered by pests and diseases. For subtropical and temperate regions: Hardiness: USDA Zone 9-11. P. amaryllifolius or Pandan Leaf is a tropical plant that prefers heat and humidity, hence sensitive to cold frost or too much wind. It is recommended to plant it in containers to easily overwinter indoors and relocate to a covered area in cold non-hardy regions. Water sparingly in winter, mindful not to water the crown to avoid cold water being retained that will result in eventual rot and demise of plant. 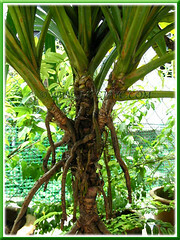 Best to propagate pandan during the warmer seasons. Read the gardeners’ experiences and care of the Fragrant Pandan at Daleys Fruit Tree Forum. Propagation: Propagate by replanting suckers that are formed at base of the parent plant or plantlets with aerial roots that grow at top of plant. However, suckers or offsets that emerge from the ground are more reliable than aerial plantlets that may fail to propagate if left to mature with hardened aerial roots. 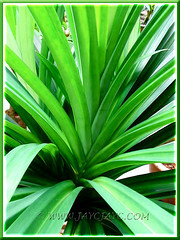 Detach the suckers or plantlets with their roots from the parent plant, remove most of the leaves leaving a few at top and plant them into moist well-drained soil. Water regularly and it’ll add new leaves in no time! 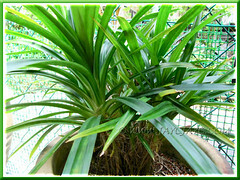 Update: May 1 2011 – learn further from our recent post on how-to propagate Fragrant Pandan. Usage: These fragrant pandan leaves with a subtle grassy-nutty flavor are well sought after for their culinary usages, especially in the Asian countries of Malaysia, Indonesia, Thailand, Singapore and Sri Lanka, as well as Australia. Why not try some tempting pandan recipes to whet your appetitie! The leaves of P. amaryllifolius are also commercially used as a food-colouring agent, as well as popular as a cockroach repellent and as natural air freshener in homes. And, in Thailand, the fragrant leaves of this edible Pandan are intricately woven into gorgeous roses and used for worship in temples. Read here at StuartXchange to know more of the uses of Fragrant Screw Pine. 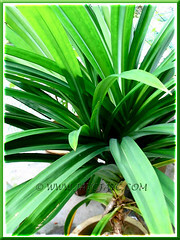 Updated 2008-03-02 – Sharing here is an image of some luxuriant plants of Pandan Leaf or Fragrant Screwpine that are growing in our neighbour’s backyard on the ground. I’ve observed that grounded plants are lusher and produce more suckers, unlike potted plants that are restricted for want of space. By the way, if you would like to know how this photo frame was done, click here. How to propagate – just separate one of the suckers with its roots from the parent plant (either pull with a slight force or use a garden spade). Next, cut away most of the basal leaves and maintain only a few remaining top ones (depending on the size of the plantlet, remove about half the foliage). Then, plant it into moist potting soil with its crown at the same level as it was previously grown. You can even soak the roots about 2 days before planting in the ground or container. Best to first locate it in a shaded or sun-filtered spot. Water moderately. and. i would like to know weather you have any powdery form of fragrance (pandan leaf aroma) for rice which is soluble in boiling water. Hello Rizlan! Sorry, I’m unable to assist you in your enquiry regarding pandan-flavoured powder. Do yoe sell the pandanus palnt or screwpine tree? Sorry, Rena – I do not market Screwpine plant. It is only grown for our own consumption. Is it possible to grow the plant from leaf cuttings bought from a supermarket? I managed to buy the pandan plant from an ebay-er (postthailand) for USD30 (including shipping to the UK and phytosanitary certificate). They sent me 2 bulbs with roots on them and I am now soaking the roots in some water. Should I just pot them up? Hi! Congrats on your new purchase, Susan! I’m not sure about online purchased bulbs. Doesn’t it come with some instructions? All the very best with your new plants. the sellers gave me your website and so i guess they might not know very much about what to do with my bulb. it looks exactly like what you have described: only few top leaves on a stem.with some roots. Have you any idea where I can buy the pandan plant online? So sorry, I have no idea. Hello from Australia. So glad to have found your wonderful pages and your excellent photographs. I am growing a Pandanus amaryllifolius/odorus plant as well as the larger P. tectorius/odoratissimus in my garden. I wanted to know more about cooking with their leaves. It seems that the leaves of either can be used, but the amaryllifolius seems to be the more common. Now to experiment with some of your recipe links. Thank you again. Thank you so much for putting a smile on my face with your kind comments! What is the lowest temperature the pandan can survive? I am in So. California and the temperature seldom freezes. It can stay in the low 100’s in the summer for several weeks. Hi I am wondering what type of fertilizer can you put in to stimulate faster & greener leaves? I am in the US. I have been using several types of miracle-gro but not sure if this is 100% effective. I also consider putting pandan tree in the vase with water and display in the house. Do you think it will possible for it to grow? I would like to know what kind of soil is good for the pandan as I am living in the middle east and the only soil they have is potting soil. Is adding charcoal good for the soil as well? Oh and i am growing the pandan from pots. Any kind of potted medium is fine, Kelvin. Of course, humus-enriched soil is the best and adding small crushed pieces of charcoal is an added bonus, I think. I was surfing the net to save my little pandan plant from I got from my mother-in-law in Malaysia. While surfing, I found your website and wonder if you could give me some advice. My pandan plant (full rooted with leaves) is about 1 month old. Within this one month, the leave had turned from green to brownish-white and now they are all gone (drop off when I lift them). However, the roots are still there, seems to be healthy. Can this plant still be saved without the leave? I had been growing pandan for 3 years but without success. This time round I decided to bring the whole plant back and I am still down with luck. I hope you can advise me before the roots are gone. Hi Andrea! In my opinion, if the roots are still healthy, then there’s a good chance of your plant surviving. It doesn’t matter that your plant is leafless now, just prune off the stem right down to about 5 cm or less above ground, and it should grow well with regular watering if well rooted. Pandan leaf is quite hardy actually. I remember one of our plants had its top being partially destroyed by monkey late last year. So, we cut off the crown, and it managed to sprout a bunch of young shoots at the cut spot months later. I purchased my Pandan from San Gabriel Nursery in San Gabriel, California. I’ve had mine for a couple of weeks now and it’s very healthy. I live in Australia (far north queensland) and have recently purchased a pandanus amaaryllifolous. I wish to infuse vodka with the leaves. Do i need to first soak or ‘cook’ the leaves before adding them to the bottle or should i take a leaf straight fom the plant and put into the bottle? Any ideas? I have been using Pandan essence for a while now in our ever popular ‘Pandanus Caprioska” which imparts a beautiful flavour but makes the vodka a very artificial green colour. Sorry, Chris…we know nothing of this. Hope other readers are able to help on this matter. Just letting everyone know I have made the vodka! I didnt do anything to the leaves at all. I used 2 leaves about 40cm long each & just ran a fork thru them both to shred them and put them straight into a 1 litre bottle of rye grain vodka. The infusion of flavours is apparent after only 24 hours, and it has already gone a nice clear green colour (similar to bison grass vodka). The flavour is just as strong but a little less artificial tasting than the previous bottles I’ve made using the Pandan essence/extract. 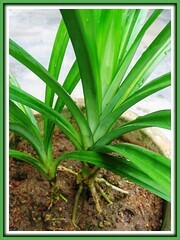 I live in Miami and i am looking to buy the Pandanus amaryllifolius plant. I second the rareflora.com website. I’ve purchased pandanus amaryllifolius from them off ebay. I originally purchased two, but one of them didn’t survive because it was too immature to be packaged up and sent long distances. They however were very quick to replace it! Now I am interested in propagating my plant, but have never done anything like this before. Would it be possible to get a step-by-step illustrated explanation on how to do this? How mature does the plant need to be before this can be done? My plant is a few months old by now, and it is growing in a 4″ pot, but it has yet to divide into smaller plantlets. Any help would be greatly appreciated, thanks! BTW, lots of useful information here! Hi Ronnie! You have to wait patiently for your plant to produce suckers (plantlets) that have their own roots before you can separate the plantlets to grow them successfully as new plants. Our experience is that potted plants do not sucker as easily as those ground-grown. Any reason why our Pandan plant’s leaf seems to not be very fragrant or add to cooking much if at all? Ha, I just noticed “John & Jac’s Garden”. That’s our names too! No idea about why your leaves aren’t that fragrant, John! Sorry. Yay, a lovely coincidence! Mmmm… I’m sure there are many more couples worldwide, like us, having this set of names, an obvious example was the late John & Jacqueline Kennedy, may they rest in peace. I recently bought a pandan plan from the vietnamese markets, re-potted the plant, and added seasol. I left it in partial sunlight, but it seems to be withering a little. The leaves at the near the bottom neck seem to have turned brown. I hope the ‘vitamins’ help. Also, it is winter in Qld, though it never gets too cold. Keeping it under an awning. Anymore tips – appreciated. We are in progress to plant daun pandan in small scale. We need 300 shoots / plant of good fragrant daun pandan. Kindly quote the price & where to collect it. Sorry, Ghana Kumar. You have to source them elsewhere because we’re not sellers or a garden nursery. helloo.. in my country pandan leaves are abundance.. one tip i can share is that we usually plant it close to sewerage o drain.it seems to like wet o soggy areas..they r quite hardy.. Thank you so much for the useful info and your call to share experiences here, Susan. Very much appreciated. I just bought a pandanus plant from my local Urban Garden Center and I’m exciting of having it! It was so cheap, too, I got it for 3 US dollar. It’s about 12 inches tall at the moment and I see a bit of side shoots about to emerge in the main stem. I’m going to transfer it to a bigger pot, then decide to where to plant it permanently. Well, I don’t know what type of pandanus species it is, but one of the Master Gardener volunteer at the time told me that it is edible. Is all pandanus species edible? I read somewhere that panadus is not fragrant until it’s process–but when I took a piece of the leaf of my pandanus plant and crushed it, I could smell the heady, grassy and nutty smell of it. Is that a typical characteristic of the pandanus plant? I wish I know what species I have! Hi Rand! Since you’re able to get the lovely fragrance as smelled from your crushed leaf, I think your species is surely ‘Pandanus amaryllifolius’, which is the only Pandanus species with fragrant leaves as stated at Gernot Katzer Spice Pages. Thank you, Jacqueline for that link! A week ago, I went to a flea market, and I realized that this plant is more commonly available in my area that I thought. One vendor, who is exclusively sell plants, has at least two potted plants–it was slightly pricey though compared to the first one I bought. The second vendor who mainly sells vegetables, has cuttings which already has roots, available. I bought the bigger cutting, the same size as my potted plant, for $2, and it is now potted and no sign of wilting. I did a simple test for the two plants a couple days ago to make sure it is a pandan by extracting the flavor through boiling the leaves in water, then crushing the leaves using a pestle, and further boiling it. I tasted and smelled it; it is definately a pandan. The bottled pandan extract from the store has a stonger flavor, though. Perhaps I should have withered the leaves first before extracting it to maximize the flavor, like what Gernot Katzer Spice Pages says. You’re most welcome, Rand. We normally use fresh leaves for flavouring our food and desserts, not withered ones. Also, we dislike using bottled pandan essence which gives a somewhat different flavour. Logically, if dried (wilting) pandanus leaves loses their fragrance quite quickly as stated by Gernot Katzer, then how could they give the best flavour to food? Probably good to smell but not great for culinary uses. responding to JOhn’s question. there are alot of ppl having the same problem like you that their pandans have no fragance at all.If yours has no smell at all it could mean that yours is not the one for cooking because there is another variety look almost identical to the cooking one and has no smell. I have seen the ‘fake’ plant, you would not be able to make the difference between the real one and the look alike until you pinch a bit of the leave and test it out. Thanks for the new insights, Dan! Never knew that there is a look-alike plant without smell. Hope JOhn reads your response. sir i just want to know if how can we really improve our product pandan air freshener for our feasibility study.. Sorry, Cherrie May…. your request is out of our league. We’re just passionate home gardeners. My pleasure, Cherrie May. Have a great week ahead. I just moved to Florida (Near Cocoa Bch. and Orlando). I would love to get ahold of some pandanus plants, plantlets, or suckers, and try planting here in my garden. I’ve seen a few website that are charging too much, in my opinion. Ebay sellers seem to have brain damage too. I would rather have plants shipped from within the U.S. I do not want to receive the lookalikes, or the flavorless varieties. Please help me out if you can send some bare root plants through the mail (wrapped in wet paper towels, or however the best way to send them might be. ). Rand, if you are still around, and have a few extra, see if you might be able to send me a few. Anyone else, I am interested, if the price is right! I have paypal. write to me directly at: jimoberlin at yah dot com. Hi Jlm… sorry we’re just home gardeners in Malaysia and not a retail nursery. Currently we just have one solitary plant without any suckers. Do check out John Smith’s comment dated Jan 3 2011 above where he had given a link to Gardino Nursery in Florida that sells this plant. Vinoth… please check it out at Gernot Katzer’s Spice Pages. Can you please tell me where I can buy a pandan plant in the Uk? So sorry, Pat…. we’re clueless since we’re residing in Malaysia. Hope others reading this post will be able to assist you. Where can I buy pandan plant in Los Angeles County? Sorry, we’re unable to assist you.